I really dont understand switching on this device, my old TPlink with openwrt have only one physical interface eth0, in default router have 2 vlans with ID 1 and 2. Vlan 1 is for virtual interface eth0.1 and vlan 2 is for interface eth0.2. port4 is off and cpu tagged. In vlan 2 port0-3 is off, port4 is untagged and cpu tagged. When i need new network i just create new vlan 3 with interface eth0.3 and then zone, for example guest_lan and join eth0.3 under guest_lan (and new firewall rule of course). But on Omnia i really dont understand switching. vlan 2 ports 4 and WAN untagged all other ports and cpu off. I give no warranty on any number in this image. Only for decoration purposes. eth-numbers are taken from the post above. Connections are from the schematic. UPDATE: eth0 is connected to the switch port 5 and eth2 is connected to the switch port 6. Ethernet interface speed/duplex manual settings? If I understood it correctly the WAN ports/zone are not using any VLANs at all by default? It’s possible to create VLAN(s) on them? Yep, depending what do you want to achieve. You can create eth1.1, eth1.5, … in networks if your WAN is VLAN trunk. You can also switch eth0 or eth2 to tagged mode on switch and create eth1.2 and put it into the bridge with WAN port. You can simply bridge those. 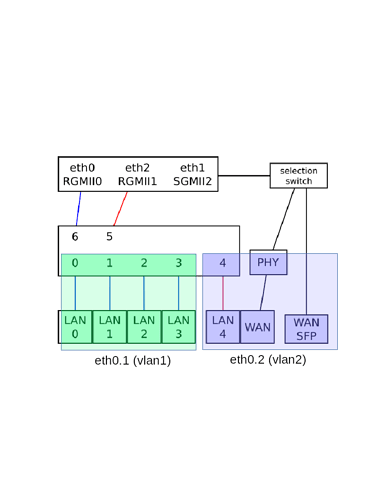 Why eth2 and eth1 must be part of eth0.2 vlan ? Or luci interface is wrong ? By default all CPU ports are untagged. There is no VLAN on WAN. Actually from Linux point of view there are by default no VLANs at all. There are VLANs set on switch chip in a way that resembles your third picture. Except, as WASN is connected directly to CPU, there is no VLAN on it. yes that is true, lan is on eth0 and eth2 and wan is on eth1. But for what he need that vlans eth0.1 and eth0.2 …When i remove this vlans ports not working (link is up but no connection). Sorry I don’t understand. If you want to have two separate VLANs on eth0, you need to setup switch so the port would be tagged on switch tab in LuCI. Then you would get both VLANs and you can separate them in OpenWRT. But I think by default VLANs with ids 1 and 2 are used in switch to differentiate between traffic for eth0 and eth2, so it would make sense to choose different IDs or reconfigure everything. Hm, yesterday I was fighting with the vlan setup in luci for quite a long time with just partial success. It doesn’t seem to be straight forwad to understand how to configure the switch. Maybe some “examples” or some documentation (Did I overlook some?) might be helpul. I tried to set up additional vlan (untagged) for DMZ. Without much success. To the default config I added vlans 3 and added port 1 to this vlan. Then I created new Interface “DMZ”, set up IPv4 addres, and DHCP and assigned the new eth0.3 to this interface. I as well removed the eth0 from LAN and added just eth0.1 and ath0.2. According the configuration in luci everything seems as expected (same as on one of my older routers), but I can’t ping the turris from the port assigned to DMZ. In the end I attached the DMZ on the port next to WAN port and added the eth2 to DMZ interface instead. But I need one more vlan and no matter what I can’t figure out how to set it up. Did you set in switch chip port for eth0 as Tagged? I did more or less all as you write, except I did not add the CPU port as tagged to all the VLANs. That might be the catch. I’ll give it a try once I get home. As stated and shown in the diagram in a previous post, the CPU used in the omnia provides 3x1gbit network interfaces, named eth0, eth1 and eth2. The switch connects to the CPU with two interfaces, Port 5 -> eth0 and Port 6 -> eth2 (eth1 is the WAN interface and is separate from the switch). In the default configuration, there are no VLANS in use (all ports are untagged). What you see in LuCI as CPU port (Port 5) is the eth0 device, and Port 6 is eth2. So at first you have ports 0-3 of the switch connected to eth0 and port 4 connected to eth2. The eth0.1 and eth0.2 devices you might see while configuring your router are actually unusable at this point. eth0.1 cannot be used because tagging is not enabled in eth0. The existence of eth0.2 is plain confusing since the vlan with the id 2 is assigned to the eth2 interface so there should be a eth2.2 device and NOT eth0.2. Now, if you want to enable VLAN tagging and create more VLANs for eth0, go to switch config, make Port 5 (“CPU” in LuCI) tagged for VLAN id 1 and BEFORE applying the settings make sure to set the ‘lan’ interface to include eth0.1 in the bridge and not eth0 that is the default, otherwise you will lose access to the router if you are connected to it via ethernet. After that you can add VLANs and use them in other interfaces etc. If you want to use VLANs with eth2 you’ll have to set Port 6 as tagged for those VLANs and manually create the corresponding devices (e.g. eth2.3 for VLAN id 3). You can do that if you go to “Physical Settings” of an interface in LuCI and select “Custom Interface”. 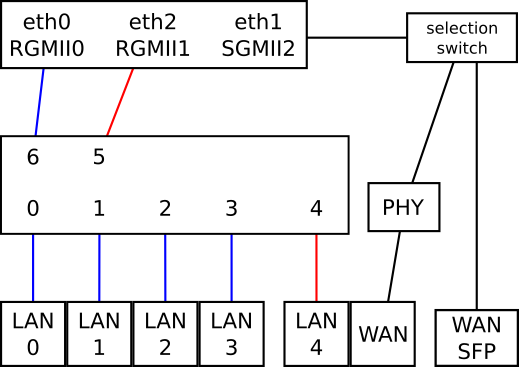 But I think by default VLANs with ids 1 and 2 are used in switch to differentiate between traffic for eth0 and eth2, so it would make sense to choose different IDs or reconfigure everything. Then… I can not have the same tagged VLAN in eth0 and eth2, true? What’s the difference between eth0 and eth2? IMHO both have the same physical connection. Through which interfaces are the WiFi cards connected? Why has port 4 a different VLAN configuration in the default switch configuration than the ports 0-3? Where can a find the “CPU” port? Is port 5 connected to eth2 the “CPU” port? I try to verify the layout with the TP-Link TL-WR1043ND schematics. The only thing I do not understand/know is what Port 4 in the switch config refers to. The interfaces eth0 and eth2 are equal. The default VLAN configuration is “banana” . CPU ports are port 5 and port 6. Did you find out through which interfaces the WiFi cards are connected?